This lady I spoke with has an exuberant spirit wherein her humanity, sense of hope and beauty spills over. She has been in our town for over a year now touching people’s lives via volunteer work and giving of herself tirelessly. She is Marinel Valentini, A staff member for the non-governmental organization “All Hands” which has helped in rebuilding homes and lives for the victims of Typhoon Yolanda/Haiyan as well as the Earthquake victims in Bohol. LL: Marinel, can you describe where you come from ? MV: I came from a large city in Italy, I've always lived in a city, always been a city girl, not used to open spaces or nature. I was fortunate enough to be an exchange student in Illinois for 8 months, Highland Il., so I saw what it’s like living in the middle of nowhere. I went to the Goldsmith University of London to do my master’s in producing musical theatre. After having been there I needed to explore the world. Then I came here to the Philippines. LL: What does a musical theatre producer do? MV: The producer is responsible for the behind the scenes for a musical, logistics, coming up with the set, auditioning the cast, etc. MV: Tacloban was at first shocking but soon enough I felt at ease, I felt I could go around on my own and people were nice. Right now at base there is a large group it feels like it’s a hostel. LL: What pivotal moment made you choose to become a volunteer? MV: always wanted to become a volunteer because I always wanted to do good. My family always donated to Greenpeace and things like that, after living in London I needed to travel the world and volunteering was a good avenue for it. LL: Why did you choose to be a volunteer worker in our place? MV: I knew I wanted to volunteer in the Philippines because of my Mom’s heritage (she’s a Filipina), there were two projects with All Hands in Bohol from the earthquake and the victims of Haiyan in Tacloban and I wanted to help the Philippines in general not just exclusively for typhoon Haiyan. LL: Has your experiences here affected you or changed you as a person? And do you think that your experience here will be useful for you in the future? MV: Yes it has changed me profoundly, I cannot even express it in words, it’s changed my perspective in looking at life, I see the communities where I have worked as an example. The Taclobanons has gone through so much but still they smile. My experience here will be useful for the future, on a personal level, yes for sure. And it made me appreciate the things I have. I am thankful, grateful for my life in general because of my experiences here. MV: I am more of an advocate, I am not good with being militant. LL: Given all that has happened in the world, the news we see, there are political and religious wars between countries, there’s terrorism and the natural disasters which we cannot control. Do you really feel there is hope for the future of our planet? MV: There is always hope even if there’s evil, we have to hold on to hope because how can we live without it. There are some things that are good. I like being in Tacloban because it’s like I am in a bubble, I am protected here from the bad things of the world. MV: The Syrian refugee crises because it’s current, I will advocate for more tolerance. The borders are strict. I feel like blocking/closing the borders are not helping them. LL: Can you still find time for your personal life given your very busy life as a staff worker of an NGO in the field? MV: Our communal living limits for personal time because I am surrounded by lots of people. So in my alone time I run in the mornings. I go to this coffee shop (Rustic Coffee). In London I couldn’t to things on my own. MV: I hope to stay with All Hands for a while, volunteer for sure, I need to get a job eventually, hopefully in the NGO industry. Help on the side. But I definitely need to travel. LL: I have 7-one-word-answer questions I want to ask you, you must choose one answer between the 2 choices and you are not allowed to explain why. Shall we have a go at it? Marinel will continue with All Hands’ remaining projects here in the Leyte and Samar and plans to go to Nepal also through All Hands for her next venture. 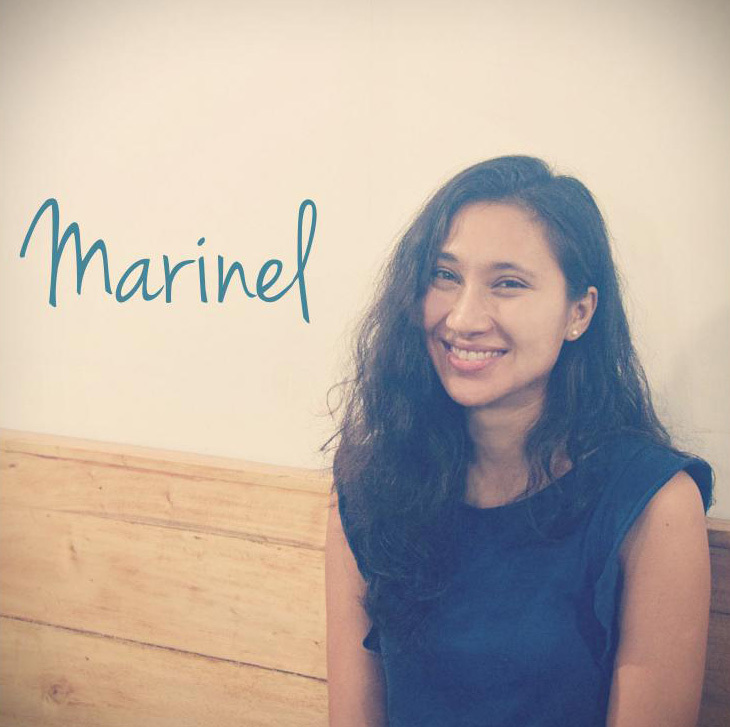 Marinel, from all of us: Thank you!